From this point the functionality remains the same: eventually you will receive an email containing a hyperlink where the file can be downloaded. Initially, Apache Solr is contacted to determine the number of records that the download file will contain. If the amount of records is less than 200,000 (it is small download), Apache Solr is queried to iterate over the results; the detail of each occurrence record is fetched from HBase since it’s the official storage of occurrence records. Individual downloads are produced by a multi-threaded application implemented using the Akka framework; the Apache Zookeeper and Curator frameworks are used to limit the amount of threads that can be running at the same time (it avoids a thread explosion in the machines that run the download workflow). If the amount of records is greater than 200,000 (it is a big download), Apache Hive is used to retrieve the occurrence data from an HDFS table. To avoid overloading of HBase we create that HDFS table as a daily snapshot of the occurrence data stored in HBase. Finally the occurrence records are collected and organized in the requested output format (DwC-A or Simple). Note: the details of how this is implemented can be consulted in the Github project: https://github.com/gbif/occurrence/tree/master/occurrence-download. Reducing both the number of columns and the size (number of bytes) in our downloads has been one of our most requested features, and we hope this makes using the GBIF data easier for everyone. I have using several times gbif data, but there is one thing I never managed to do so far: open and visualize downloaded data in Darwin Core Archive. It is perhaps trivial but still I never found a way to open properly those files. Does anyone could help me? 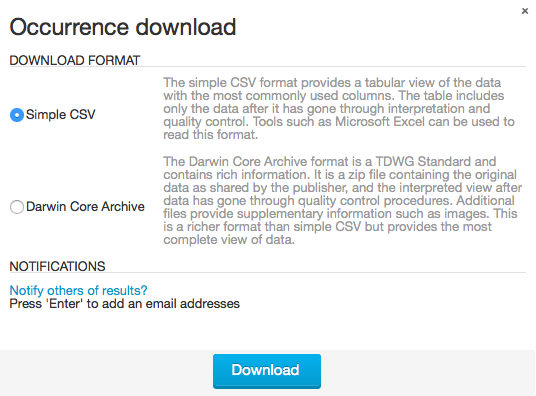 Still if ones want to have full information, it is better to download data in Darwin Core Archive. However, I have been struggling for several days for finding out how it is possible to have access and vizalize occurrences data from this Darwin Core Archive files. Does anyone can help me?? ?